With more than 150 students and dozens of employers attending, the 2019 Global Diversity and Inclusion Conference held at Rose Hill on April 3 was the largest since the conference began in 2013. The gathering culminated with an evening banquet where three students who took an unflinching look at diversity at Fordham and in the Bronx were honored for their work. In addition to seasoned professionals, young alumni sat on panels representing people of color, social justice activists, and LGBTQ communities. Natalie Erasme, FCRH ’18, an intern at the New York City Department of Health and Mental Hygiene, said she wanted to share recent experiences with undergraduates. “It’s really important for alumni who are not too far out in the workforce to come back, because things are changing rapidly, and the experience of transitioning to the workforce from school is fresh in our mind,” said Erasme, who sat on the social justice panel. Claudia Law, FCRH ’16, says she always wears her class ring; the pin is reserved for special Fordham occasions–like the Diversity and Inclusion Conference. Paola Joaquin Rosso, FCRH ’17, said she attended conferences for years as a student and found being on the LGBTQ panel with like-minded alumni “very calming.” Rosso works with Make the Road New York, a nonprofit group that provides resource assistance to low-income families. “It was good to be in a room with a decent amount of people who are engaged and had really good questions for us,” she said. 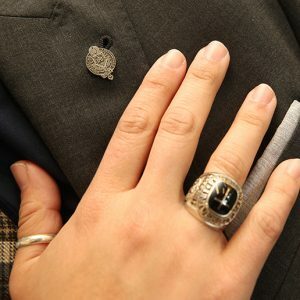 Claudia Law, FCRH ’16, wore a Fordham pin on her lapel and a class ring on her finger, which she said she always wears. She was proud to share her success story. At just 25, she is the director of operations at Progressive Pipeline Management, an infrastructure firm that handles chemical and natural gas pipelines. “It feels great because in three short years a lot has changed and I’ve made a lot of myself,” she said, beaming. Most of the alumni promoted diversity during their time at Fordham and were curious to see if their efforts were continuing. “It definitely shows a change in mindset,” he said. Indeed, physical space, whether a bathroom or the borough, was a big topic. Most Rose Hill commuter students are people of color, and many hold definite ideas about community, both on campus and off. “The students here now are doing a great job at being able to vocalize the needs of the commuter population in student life,” said Rosso. Bronx-born Erasme said that during her time on campus, she found community through the Dorothy Day Center, which has since been incorporated into the Center for Community Engaged Learning. There, she met resident students willing to engage with residents of the Bronx through College Access, a student-led group that helps teens through the college application process. “Everyone needs to be open to the broader discussions,” she said. Ashley Qamar, a Gabelli School junior who co-chairs the Diversity Action Coalition, a USG committee working with students on minority issues, concurred with Erasme. “The face of a Fordham student has changed so much from now versus ten years ago, and we need to address that,” she said. Qamar, who identifies as a “straight Asian Latina,” said that events like the conference create community. She praised the visibility of Juan Carlos Matos, the assistant vice president for Student Affairs for Diversity and Inclusion, and Chief Diversity Officer Raphael Zapata, whose offices sponsored the event with Career Services. She cited a recent art opening for women of color held at both the Rose Hill and Lincoln Center campuses as an example of a forward-thinking approach. “I have never been to an event like that at Fordham, and it was so unbelievably beautiful,” she said. At the conference, several attendees praised a new wave of inclusive events on campus, like the women of color art exhibition presented on March 25 and 26 at Rose Hill and Lincoln Center. (Photo by Ayesha Akhtar). The evening’s banquet also presented art as a way to move the diversity discussion forward. Three students took home prizes for the student case competitions. Gabelli School junior Huyen Lam won third prize for a multimedia graphic that used photos and text to portray Bronx landmarks and common sights such as children playing under sprinklers and homeless begging on the streets. She represented her Vietnamese and Chinese background as a central feminine figure facing the action. Second prize went to the hard-hitting video, “Bridging the Gap: Fordham University and The Bronx.” The video features Fordham students from the Bronx addressing the preconceived notions about the borough that they’ve encountered in their fellow classmates. Senior Kayla Valez and junior Dajasmin Rodriguez, both students at Fordham College at Rose Hill, created the piece. 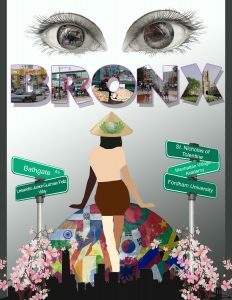 Huyen Lam won third prize for her multimedia graphic about the Bronx. First prize went to the essay, “A Mission of Seeking Difference,” by Gabelli senior Isabelle Hanson. In it, Hanson, whose father is Polish-American, and whose mother is from Taiwan, addresses micro-aggressions she experienced on campus. She said they’re reflective of American society as a whole, not simply Fordham. “One trend is a tendency to talk about differences through a negative lens,” Lam said by phone from Fordham’s London Centre, where she is studying this semester. She said that many of the diversity conversations happening on college campuses should have happened in the home when people were young. “By the time my friends learn about the magic of diversity, it’s harder to digest, because by then diversity becomes about quotas and tolerance,” she said. And long-held views become entrenched. “It’s really difficult to confront someone when they are having issues like this. There’s this tendency to deny, deny deny,” Lam said.